New York: Harper & Row, 1986. 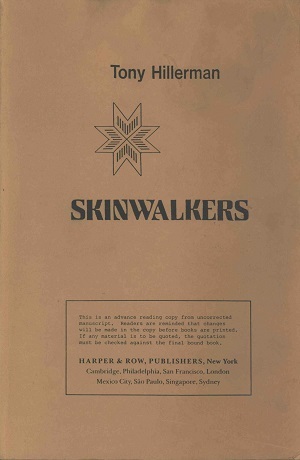 This is the advance reading copy of Skinwalkers. This edition was produced in 1986 by Harper & Row in New York City, New York. Skinwalkers is the seventh book in Tony Hillerman's Navajo Mystery Series. "This is an advance copy from uncorrected manuscript. Reviewers are reminded that changes may be made in this proof copy before books are printed. If any material from the book is quoted in a review, the quotation should be checked against the final bound book." Format: Paperback, 22.3 x 14.5 cm. Binding: Tan paper covers with the title, author, and publisher printed vertically in black on the spine.